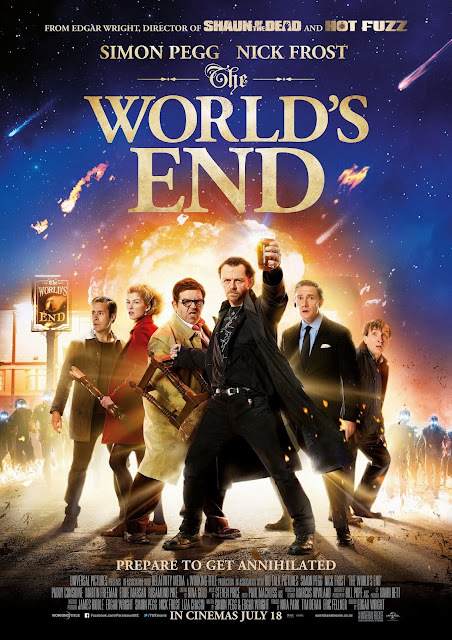 Chrichton's World: Review The World's End (2013): If only it did end, what a drag! Review The World's End (2013): If only it did end, what a drag! A parody on apocalypse and science fiction movies made by the same team who were responsible for Shaun of the Dead and Hot Fuzz, surely The World's end would be on par or even better. Sadly something went horribly wrong here. The parody bits or references aren't arriving as they should. Far too subtle or maybe too lazy to refer to apart from the few that were obvious. In this article they explain themselves why that is. In my opinion a big mistake. Because it takes out the comedy right out the events. And putting it mildly makes a lot that is appearing on the screen drag too much. In every pub they go to it is basically the same thing. Now I did think it was funny the main character was still out to finish his pub quest but come on how likely is it for someone to finish it at all costs when you know that aliens are after you. Sure I understood that the main character was not entirely sane and he was meant to be seen as a tragic figure instead of a hero. Still what was the aim, what was the goal to show the audience this? We don't see any development in his character at all. No realization in any of the characters. If they were going for some deeper meaning than they failed to deliver it because at the time this film was finished I was glad it was over. I am sorry they can spin it how much they want. But I don't like it when movie makers point the fingers to the audience that they don't understand instead of blaming themselves for not being able to deliver whatever this message is what they wanted to deliver. There was nothing clever about The World's End. Shaun of the Dead was more than a parody. Hot Fuzz was more than a parody. They very uniquely combined genres and made it into two very funny and entertaining films. The World's End tries to be different and fails to deliver in the end. Now don't think it is an entire waste of time. There is just enough at times that will make you smile. Enough to make you appreciate it though? No, I don't think so. Epic Fail!